It's kind of a chicken and the egg situation. Did I start out as a papercrafter or a quilter? Which hobby lead to the other…all I can say as I've been "crafty" for so long I can't remember that far back…I just know that I love both so this adorable Christmas Quilt Bundle was calling my name. How could I ever resist and really why should I? Paper…Fabric…it's a perfectly legal addicition and harms no one! Here's my sweet little card using the Christmas Quilt Bundle and I've forgone the traditional Christmas colors and used it as a Fall Friends card. 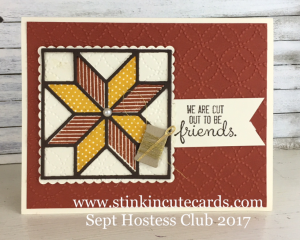 We used this card back at my September Hostess Club and I can't wait to whip up a few more quilty samples. I am going to drop this one into the mail tomorrow to a long time friend that's going through a rough patch right now. She's also a quilter so she gets it. Hostess Club meets this month on Oct 5th & 6th. Stop into the studio and check out the fun things we have in store THIS month. New clubs are starting next month but again, we welcome drop ins anytime.